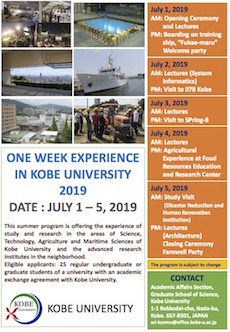 Between July 1 and 5, a short-term summer school program of "One week experience in Kobe University, 2019" will be held. The program is organized by six natural science graduate schools within Kobe University. As well as lectures in English, the students will experience sea training on the University's training ship Fukaemaru, participate in hands-on agricultural training at the Food Resources Education and Research Center, and visit the SPring-8 facilities and so on. On the final day of the week-long program, Dean of the Graduate School of Science will present each student with a certificate of completion. Copyright © Graduate School of Science / Faculty of Science - Kobe University. All Rights Reserved.